Each Newsletter is comprised of a Volume number, Author and Articles. The first step is to create your Newsletter. 1. Click the Add New Newsletter icon to create a Newsletter. 2. Enter the appropriate information for this newsletter. •Name – This is the name of the Newsletter. •Summary – Enter a summary for the Newsletter. •Publish Point – This is the URL of the website to publish the Newsletter. •Subscription Link – If you wish to have a link within the Newsletter where a reader can subscribe, enter the URL for the page link. •Archive Link - This optional link is to a website URL where past issues of the Newsletter are available. •Unsubscribe Link – This URL leads to a website where current Newsletter subscribers can cancel their subscriptions. This is included in the Newsletter Email. •Logo – Click the Browse button to choose a Logo Image and click the Upload button to use it for this Newsletter. •Editor – Click the Change link to assign or change an editor to this Newsletter. This opens the Person Pop-up Search, where you can choose a person. If there is no editor, the check box is disabled. •From Name – Enter the name of the sender of the newsletter. •From Email – Enter the email address of the sender of the newsletter. 3. Click the Save button when finished. 4. Click the Newsletter Name link to open the Newsletter Details and view the Volume and Author Lists. The Volume List shows the Publication Date, Volume Name, the number of Articles, Publications Status, Sent (via Email) status, the number of Reads, and a Preview link for each Volume created within the Newsletter selected. 1. Click the Add New Volume icon to add a new volume or issue. This creates a new entry named [new volume]. Click the Edit icon to open the Volume Details. 2. Complete all fields, as desired. •Name - Enter the name of this Volume. •Notes - Enter any additional description needed to identify this issue. •Promotion Summary – Enter a summary for the promotion. •Publication Date – Enter a publication date. This defaults to the Volume created date. •Sent Status - This is a system-generated field that shows the date the newsletter was sent (if it was), or it shows Not Sent. •Published - Select this check box to indicate you have published this Volume on the Arena-managed website. •Promotion Image - Click the Browse button to locate an image for the promotion of this Volume. Before you create Articles, you need to add at least one author. Below the Newsletter Volumes is the Author List that includes information about each author. 1. Click the Add New Author icon. This creates an author named [new author]. 2. Click the Edit icon to open the author page. The information you enter here displays on your organization’s Arena-managed website for the Author information in the Article. •First Name - Enter the first name of the Author. •Last Name - Enter the last name of the Author. •Email - Enter the email address for the Author. •Bio - Enter the biographical information for the Author. •Source - Click the drop-down list for the source of the Author. See your Arena Administrator to edit Sources. •Author Image - Click the Browse button to locate an image for the Author. Click the Upload button to add it to the Author entry. The last part of the Newsletter features is where you create Art. The Article List page displays the Article Name, Average Score, the number of times the article was Read, a thumbnail for the Summary and Article images, Summary Word Count, and the Text Word Count. 1. Click the Add New Article icon. This creates an entry named [new article]. 2. Click the Edit icon to enter the article details. •Title - Enter the title of the article. •Summary - Enter a concise overview of the article that displays as the link to the article on the Arena- managed website. •Copyright Info - Enter the details concerning copyright information relating to this article. •Copyright Owner - Select the owner of the copyright from the drop-down list. You can customize options in the Newsletter Copyright Owner Lookup. •Article Type - Select if this Article is a Feature Article or a Body Article. A Featured Article shows in the Volume Summary, and a Body Article only displays when users view the full Volume. •Author - Click the drop-down list to select the author of the article. You can create the authors in the Newsletter Authors section. •Article Full Text - Enter the full article in this field, using RAD editor functions as desired. 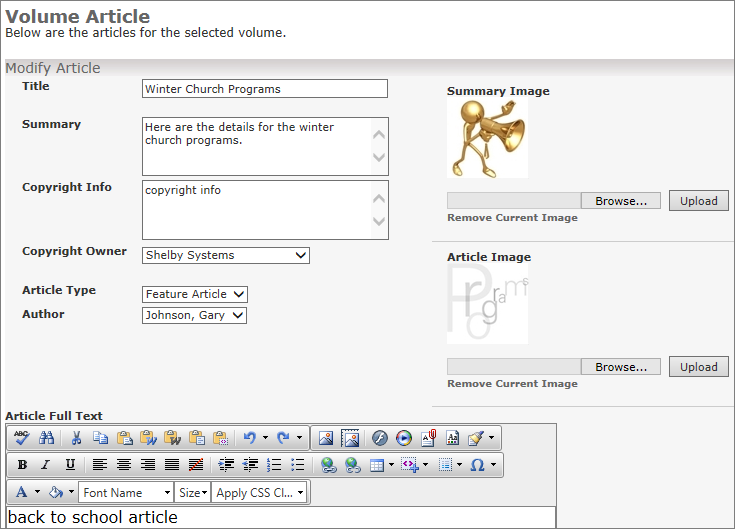 •Summary Image - Click the Browse button to associate a photo with a group of articles that are in the same category. Click the Upload button to include it in the article. •Article Image - Click the Browse button to associate a photo with this specific article. 3. Click the Upload button to include it in the article. See your Arena Administrator if this option is not available. 1. Go to the Newsletter page. 2. Click the Number link in the Subscriber Count column. 3. Click the Add Newsletter Subscription icon. 4. Enter in the first name, last name and email address. 5. Click the Update icon. Arena does not add people entered on this page.